A stunning two-metre high steel sculpture by University of Southampton art graduate Lucy Unwin takes pride of place at the University of Winchester's new flagship building, the University Centre. The major sculpture 'The Dancers' was commissioned after Lucy's work was spotted on display at the Art in the Garden exhibition at the Sir Harold Hillier Gardens, in Ampfield, near Romsey, last summer. 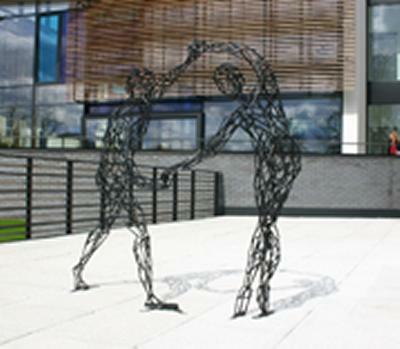 The work features a pair of dancers and looks out across the terrace at the new centre. Lucy's sculpture complements the unique contemporary design of the building which this month (May) won a RIBA Award for the South region - a prestigious design award from the Royal Institute of British Architects. Lucy, 24, from Essex, graduated with a BA in Fine Art Sculpture from the University of Southampton's Winchester School of Art in 2006. She said: "I was absolutely delighted to receive this commission. 'The Dancers' is a modern sculpture for a modern setting. "As a new and emerging artist, I hope my piece reflects some of the vitality and ambition of the students on this innovative and contemporary campus." She explained that the sculpture was created by intertwining five metre lengths of steel rod in three different thicknesses building the figures up like a jigsaw puzzle. The main difficulty she experienced in creating 'The Dancers' was making the sculpture strong and self-supporting, at the same time as infusing a sense of movement and lightness. Lucy has also had work commissioned for the Brewery Conference Centre, in London, sold work to private buyers and is currently exhibiting several stone and metal pieces at The Bergh Apton Sculpture Trail, in Norfolk. Digital images of Lucy's work are available from Communications on request. Lucy, 24, graduated from Winchester School of Art with a degree in Fine Art Sculpture in 2006. She has a number of sculptures currently on display - 'The Reader' and 'Leap of Faith' are both permanently at The Brewery, Chiswell Street, London. She is also currently exhibiting at the prestigious Bergh Apton Sculpture Trail, in Norfolk. More information about Lucy and examples of her work can be found at www.lucyunwinsculptures.com.